Kevin Conway, assistant professor and curator of fishes with Texas A&M’s department of wildlife and fisheries sciences at College Station, has published his research at Texas A&M University that documents a new species of clingfish — and a startling new discovery in a second well-documented clingfish. 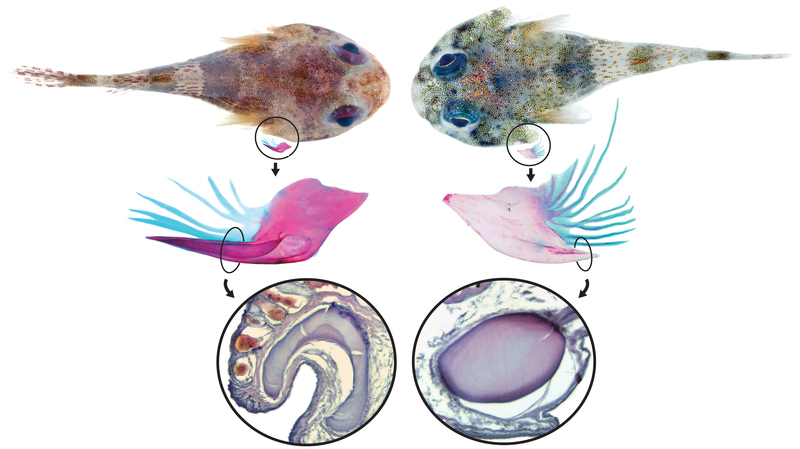 The paper, entitled “Cryptic Diversity and Venom Glands in Western Atlantic Clingfishes of the Genus Acyrtus (Teleostei: Gobiesocidae),” was published May 13 in the PLOS ONE online journal. PLOS ONE is the Public Library of Science’s peer reviewed, open-access scientific journal. The scientific paper documents the study Conway and his team, including Carole Baldwin, his collaborator at the Smithsonian Institution, and Macaulay White, former Texas A&M undergraduate, have been working on for several years.